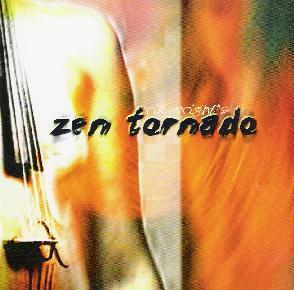 Rik Wright's Zen Tornado - "s/t"
Seattle guitarist Rik Wright and his band, Zen Tornado, produce a very challenging and complex form of jazz-rock fusion in the tradition of bands like the Mahavishnu Orchestra, though with the addition of James DeJoie's alto and baritone sax often taking the front seat, there seems to be somewhat of a John Coltrane influence as well. Add to that Alicia Allen's stellar violin playing (which gives the music a touch of ethnicism at times) and the manic rhythm section of James Whiton or Walter White on bass and Simon Grant on drums, it all makes for a heady fusion freak out. The album opens with Hummingbirds Don't Sing and the European sounding strains of Allen's violin, before leaping into a jazz-rock number that has a dash of classical feel but also a Hot Rats era Frank Zappa vibe to it. This sets the tone for the album, one where the rock elements of the music are as equally important as the improv jazz elements. The most Coltrane influenced track follows, Blue Streak, with DeJoie really blowing the hell out of his sax while the rest of the band jams along with him, from romping rhythmically complex sections with a blues edge to them, to passages of pure free form freaking out. Sunrise Pixels is Allen's turn to shine, with some gorgeous, slightly strained for a bit of musical tension, but nonetheless melodic violin carrying the piece for the first few minutes till the rest of the band joins in for some more mellow explorations. Boogie for Bhudda has a swing beat to it, with each of the members getting their chance for soloing. With its funky bassline and grungy sounding sax, Paradigm has a bit of that Zappa influence again, but ScratchTticket takes a much more lyrical approach, almost in the vein of early Return to Forever, with DeJoie trading his sax for a flute. Clickstream finishes things off with another grungy workout, DeJoie going for broke on his sax again and the rhythm section getting a chance to show off too. Throughout the entire album, bandleader Wright's guitar playing is creative and impeccable, without being flashy. Wright isn't a speed freak, nor does his ego seem to demand that he is always out front in the sound, which is refreshing. His understated guitar anchors all the pieces without playing all over the other musicians, giving the sound excellent balance. Although Wright has been around on the Seattle jazz scene for some years now, this is the first official release of Zen Tornado, and it's a great debut. I'm sure we'll hear plenty more from this group in the future. For more information you can visit the Rik Wright web site at: http://www.rikwright.com. Visit the HipSync web site at: http://www.hipsync.com.